"Wang Geon" or "Wang Kŏn" redirects here. For the historical drama, see Taejo Wang Geon (TV series). Taejo of Goryeo (877-943, r. 918-943), the founder of the Goryeo Dynasty, ruled Korea from the tenth to the fourteenth century. As the first king in a new dynasty, historians gave him the name King Taejo of Goryeo. The name "Taejo" is comprise of two Chinese characters, "Tae," a derivative of 'Dae' (big), which means "very big" or "great," and "Jo," which means "grandfather." Together, they mean "Great Progenitor." After being crowned as the ruler of Taebong (formerly Gogyryeo), he expanded his territory by successfully conquering Silla and Baekje, as well as Balhae. Realizing that the security of his kingdom depended on the support of the rulers and nobles of the territories he had annexed, he gave them land and titles. His leadership led the unification of the entire Korean peninsula for the first time since the end of the Gojoseon kingdom, more than 600 years earlier. Korea remained united from 936 time for more than 1,000 years, right up until 1948. During his lifetime, King Taejo was also known as Wang Geon. Taejo Wang Geon (태조 왕건) was born in 877 into a wealthy merchant clan based in Songak (now known as Kaesong), and which controlled trade on the Yeseong River. His father, Wang Yung, was the clan leader and had gained much wealth from trade with China. His ancestors were known to have lived within ancient Goguryeo boundaries, thus making Taejo a Goguryeon by descent. Map of Korea during the Later Three Kingdoms period (892-936), which immediately preceded the Goryeo period. Taejo's career began in the turbulent Later Three Kingdoms period (후삼국 시대; 後三國時代; Husamguk Sidae). In the later years of Silla, many local leaders and bandits rebelled against the rule of Queen Jinsung, who did not have strong leadership nor policies that improved living conditions. Among those rebels, Gungye (궁예; 弓裔; Kungye) of the northwestern region and Gyeon Hwon (견훤; 甄萱; Kyŏn Hwŏn) from the southwest gained the most power. As their troops marched against local Silla officials and bandits, they defeated and absorbed members of many other rebellion groups. In 895, Gungye led his forces into the far northwestern part of Silla, near Songdo. Wang Yung, along with many other local clans, quickly surrendered to Gungye. Taejo followed his father, Wang Yung, into service under Gungye, the future leader of Taebong, and he began his service under Gungye's command. Taejo's ability as a military commander was soon recognized by Gungye, who promoted him to general and even regarded him as a brother. In 900, Taejo led successful campaign against local clans and army of Later Baekje (Hubaekje) in Chungju area, gaining more fame and recognition from the king. In 903, he led famous naval campaign against the southwestern coastline of Later Baekje, while Gyeon Hwon was at war against Silla. While continuing to lead military campaigns, he became known for his generous treatment of the poor people among the Silla territories he conquered. His leadership and generosity made him popular among the common people. Gungye proclaimed himself king of Later Goguryeo (Hugoguryeo) in 901, changing the name of the state to Majin and then Taebong in 911. At its strongest, Taebong included parts of present day Hwanghaebuk and nam-do, Gyeonggi-do, Gangwon-do, Pyongan-namdo and Chungcheongbuk-do. In 913, Taejo was appointed Prime Minister of Taebong. As time went by, Gungye became tyrannical, and in 918 four of his top generals—Hong Yu (Goryeo)|Hong Yu (홍유; 洪儒), Bae Hyeongyeong (배현경; 裵玄慶; Pae Hyŏn-gyŏng), Shin Sung-gyeom (신숭겸; 申崇謙; S(h)in Sung-gyŏm), and Bok Jigyeom (복지겸; 卜智謙; Pok Chi-gyŏm)—met secretly and agreed to overthrow Gungye's rule and crown Taejo, then Prime Minister, as their new king. Taejo first opposed the idea but later agreed to their plan. A short time later Gungye was overthrown and killed near his capital, Cheorwon. When Gungye was assassinated, the generals installed Taejo as the new king of this young state. Taejo was crowned king and renamed the kingdom Goryeo, thus beginning Goryeo Dynasty. The following year he moved the capital back to his hometown, Songak (Kaesong). Taejo promoted Buddhism as the national religion, writing Ten Injunctions, a treatise containing his philosophies regarding governance, and including direction that the government not interfere with Buddhism. He also sought for the reconquest of the northern part of Korea and Manchuria, which was controlled by Balhae. Balhae's rule over the vast region of Manchuria and parts of Siberia was overthrown by the Khitan invasion in 926, and the majority of its people came to Goryeo as refugees led by Balhae's last Crown Prince Dae Gwang-Hyun. Taejo accepted them as his citizens, since Balhae and Goryeo came from common ancestry, that of Goguryeo, took control of the old, then abandoned capital city of Goguryeo, Pyongyang. He also sought for alliance and cooperation with local clans rather than trying to conquer and bring them under his direct control. Having gained control of the northern territories, Taejo then turned his sights on Silla and Later Baekje. In 927, Gyeon Hwon of Later Baekje led forces into Silla's capital, Gyeongju, capturing and executing King Gyeongae. Leaving King Gyeongsun in place as his puppet monarch before he turned his army toward Goryeo. Taejo, hearing of the news of the conflict between the two kingdoms to the south, felt he had an opportunity to absorb Baekje and Silla into Goryeo, and attacked Gyeon's troops on the way back home from Silla, at Gongsan near Daegu. When he first met the Later Baekje forces, Taejo and the Goryeo forces suffered a disastrous defeat, losing most of his army including his best warrior Shin Sunggyeom, the very same man who had crowned Wang king. However, Goryeo quickly recovered from defeat and successfully defended against the next Later Baekje attack on its front. A few years later, in 935, Silla's last ruler, King Gyeongsun, felt there was no way to revive his kingdom and surrendered his entire land to Taejo. Taejo gladly accepted his surrender, gave him the title of prince, and accepted his daughter as one of his wives (Taejo had six queens, and many more wives as he married daughters of every local clan leader), which gained him a certain amount of support from the clans, but also left behind a large number of nobles claiming connections to the throne and a right be in the inner circle. Later Baekje's Gyeon Hwon watched Taejo's conquest of his neighbor to the east, Silla, with disgust. Gyeon's father, who held his own claim of Sangju region, also defected and surrendered to Goryeo and was received as the father of an emperor. 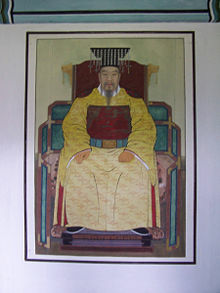 In the same year, Gyeon Hwon's oldest son, Singeom (신검; 神劍; S(h)in-gŏm), led a coup against his father, who favored his half-brother as his successor to the throne. Gyeon Hwon was sent into exile and imprisoned in a Buddhist temple, but escaped to Goryeo and was treated like his father, who died just before Gyeon Hwon's surrender. In 936, Taejo led his final campaign against Singeom of Later Baekje. Singeom fought against Taejo, but facing much disadvantage and inner conflict, he surrendered to Taejo. Taejo finally gained full control of Later Baekje, and unified the Korean nation for the first time since Gojoseon; He ruled until 943, and died from disease. Taejo sought to bring even his enemies into his ruling coalition. He took care to cultivate the loyalty of the rulers and nobles from the various territories he had defeated, Later Baekje, Silla, and also Balhae, which disintegrated around the same time, giving titles and land to those who held the power, thus gaining their support. In this way he secured stability and unity for his kingdom which had been lacking in the later years of Silla. The unification of the Later Three Kingdoms in 936 was very important in Korean history; the unification of 668 by Silla was completed in only half of the nation, since the northern part was ruled by Balhae, the revival of Goguryeo. However, Taejo's unification in 936 was a full-scale unification, with the agreement of all Korean people—and the nation remained as single, unified country until 1948, when Korea was divided into North and South. Many modern Koreans look on his legacy—the only one who unified the divided nation in its whole history—to find hope from his leadership and to draw comparisons with the current situation. ↑ Combining his rule of Taebong and Goryeo. He only established Goryeo in 936. All links retrieved November 11, 2015. History of "Taejo of Goryeo"
This page was last modified on 11 November 2015, at 16:15.